Fifty years ago, Camellia seeds designated only as plant introduction (PI) number 162475 traveled from China to make their American debut at the U.S. National Arboretum in Washington, D.C. The seeds were started in a greenhouse. But, the resulting small trees had simple white flowers and weren't as exciting as their showy colorful cousins, Camellias sasanquas. So poor little PI 162475 was planted on a lower, less-traveled path, surrounded by other trees. The unremarkable camellia was soon forgotten. But 30 years later, severe winter storms killed the neighboring C. sasanquas. 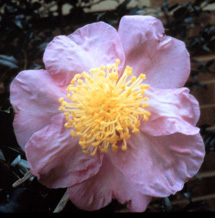 In all, the harsh winters of 1977 to 1979 annihilated more than 950 camellias in the arboretum's Asian garden. When the stately C. sasanquas lining the lower path were killed, PI 162475 was revealed. Not only did it survive, but it graced the garden with snow-white blooms in the following years. Later, this plain but strong-willed survivor would become the ancestor of a colorful new cold-hardy camellia dynasty. During the killing winters, William Ackerman was a horticultural expert at the arboretum, which is part of USDA's Agricultural Research Service. He was involved in a breeding program to develop more cold-hardy camellias. This garden Cinderella with the scientific name of Camellia oleifera was just what he needed. Yet Ackerman realized much had to be done to make this plant's progeny market-ready. It was hardy, but a little homely in the eyes of camellia connoisseurs. The plant's flowers fell apart at a touch. Snowy white petals on an autumn breeze may be poetic, but a quality plant keeps its blossoms. Plus, American consumers want colorful camellias with multiple petals. As work began on crossing this plant, it was decided that it should have a proper name. "Lu Shan Snow" was selected in honor of the original location where the seed had been collected in China. Introduced from the Lu Shan Botanical Garden in Kuling, China, Lu Shan Snow can survive temperatures as low as -15oF. That's USDA plant hardiness zones 6a to 5b. 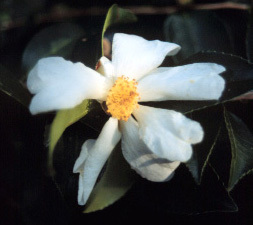 The average camellia can't handle temperatures much below 5o F. In 1979, Ackerman began crossing Lu Shan Snow with popular cultivars and released new cultivars beginning in 1986. "What Bill did was a lot of hybridization, coming out with 20 new cultivars that could go down to -10oF to -15oF," says Ray Bond, of Bond Nursery Corp. in Dallas, Texas. "When he wrote about those hybrids in Horticulture in 1993, there was a huge demand. Everybody wanted these flowers, and nobody had them." 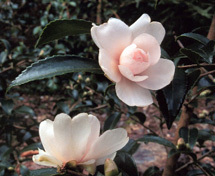 Camellias were once considered a "perk" of southern living. Today, gardeners as far north as coastal Massachusetts enjoy them, thanks to Ackerman's breeding efforts. Bond says the Ackerman lines are so desired by residents in one Pennsylvania town that the nursery sells out almost as fast as he can ship them. That's because when people move there from the South, they want to bring their beloved camellias. Now they can. The U.S. National Arboretum presents a unique group of cold hardy, fall blooming camellias hybridized specifically for the landscape. Tough enough to thrive in the mid-Atlantic region as far north as U.S.D.A. Zone 6b, these lovely evergreen shrubs produce showy flowers of pink or white over a period of 4 to 6 weeks in late autumn. Petals are shed individually when bloom is completed--eliminating the tiresome task of dead-heading for the gardener. 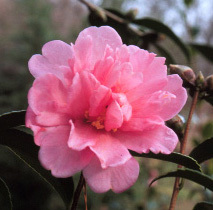 Plant smart and be charmed all winter by one of these exceptional landscape camellias! Camellia ‘Polar Ice,’ Snow Flurry’, Winter’s Hope’, Winter’s Rose’, Winter’s Star’, and Winter’s Charm. Culture: Camellias prefer moist, well-drained, acid soils with high organic matter content. Mulch should be applied and maintained year round. They benefit from light shade in summer and protection from winter wind. Fertilize minimally to prevent leggy, unattractive growth.